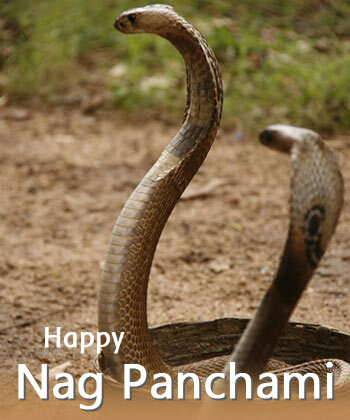 Nag Panchami is a unique hindu festival dedicated to worshipping of Snakes in India. Know more on celebrations, and date for Nag Panchami in 2019. Nag Panchami - In a country where inextricable links between religion and nature defines the Hindu way of life, Nag Panchami festival is one of the most ancient festivals that connect the diverse states of the country. Since the fifth ‘tithi’ or date favours the worship of serpent deities, Nag Panchami festival falls on the fifth day of the holy month of ‘Shravan’ month. Snake worship in the Hindu culture can be traced to the time of Indo-Aryan invasion, and still carries on continues to be an integral part of the Hindu religion. Snakes symbolise energy and good fortune according to Hindu mythology. ‘Nag Panchami’ is believed to be one of the most auspicious days to propitiate the 'Nag Devta' in the entire year. The Puranas state the importance of Naga Panchami festival. The Bhavishya Purana explain that bathing of snakes like ‘Vasuki’, ‘Takshaka’, ‘Kaliya’, and ‘Dhananjaya’ with milk on this day ensures freedom from danger of snakebites. It is also considered auspicious to perform ‘puja’ on this day as it may free devotees from the ill-effects of ‘sarp-dosh’ in their horoscope. It is believed that puja and self-austerity on this day pleases Lord Shiva. Mythical stories and fables about serpents, especially about the Sheshnag of Lord Vishnu as is pictorially depicted in the picture of Lord Vishnu reclining against thousand-headed Ananta, the ‘Shesh Nag’ while sleeping in the sea. A legend goes that while tilling land, some serpents got killed and the mother serpent avenged the family by killing all the family members except one who was praying to the Nagas. Seeing this, she restored the life of the full family. Myths also point out that Janmejaya, son of Parikshit was stopped by Goddess Mansa devi from doing the ‘sarp satra yagna’ on this day. Thus, Nag Panchami festival is observed in these contexts. The legend of snake Kalia bowing down to Krishna in humility is also recognised on Nag Panchami day. On this day, people observe fast to sanctify this day and offer milk, ‘kheer’, ‘chandan’ (sandalwood paste) and turmeric powder along with the chanting of mantras to the serpent idol in temples or at homes to appease the ‘Nag Devta’. Married Hindu women perform these rituals with complete devotion and preparedness. Lord Shiva is also worshipped as he is universally depicted as wearing a snake around his neck. Milk and flowers are also placed near the holes near the gardens. On this day, kids enjoy kite flying, girls enjoy swing, and people buy snakes images to worship. Milk and a milk-based delicacy are offered to snake images and idols. Typically, the idol is immersed ritualistically in the river. In Southern India, particularly in Kerala, devotees throng snake temples to pay obeisance to the idol of serpent ‘Ananta’ or ‘Shesha’ which also represents eternity. The festivities for Nag Panchami are visible throughout the country with elements of religious music, dance, acrobatics incorporated in the events being organised. Kite flying and wrestling competitions are also common in several parts of the country. Kerala is known for deifying snakes, and King Cobra is the worshipped in tribal areas in the state. Snake boat race is a major event in Kerala is also held. Battis Shirala, a small town in Maharashtra state has acquired prominence for its celebration of Hindu festival Nag Panchami. Thousands of people descend on this hub of festivity to mark this day. In Maharashtra, women do ‘parikrama’ around the anthills, and invoke the snake gods with offerings of turmeric and vermillion and milk. Nagoba Temple in Mahal witnesses huge number of devotees on Nag Panchami day. Pilgims take the 'Nagdwar Yatra' to Pachmarhi on this auspicious day. In Varanasi, a shrine dedicated to Naga Raja (King of Snakes) is worshipped with milk and water. Nag Panchami celebrations include wrestling matches. In Kanpur, Nageshwar, and Kherapati temples are hubs of these activities. In the Punjab, the traditional way of performing the ritual in Punjab on ‘Nag Panchami Day’ is to carry a snake idol in the city in a procession-like manner and then after offerings have been made, the idol is ceremoniously buried. Women pay obeisance to the snake god with curd. In Gujarat, a part of the formidable Bhujia Fort in Bhuj is dedicated to Bhujang Nag (snake god). A big traditional fair is held to mark the occasion of happiness on Nag Panchami Day. In Karnataka, people observe a fast or stick to saltless meals. ‘Puja’ is followed by a celebratory feast. Women decorate anthills with turmeric paste and vermillion and sugar mixed with wheat flour. In Coorg, laddus made with sesame and groundnuts are prepared much in advance. In Bengal and Assam, Mansa, who is considered the queen of snakes, is worshipped with offerings of milk and fruit. Typically, a twig of the plant representing Mansa is used for the rituals. Overall, Nag Panchami Day is a day for seeking the blessings from the nine serpent-deities for happiness, prosperity in agriculture and for keeping families and relationships intact.